Just as individuals do a little cleaning in the spring, it seems inevitable that companies eventually go through a similar process leading to the elimination of positions. If you find yourself in a situation of career uncertainty, building your confidence in advance will help overcome the fear and uncertainty created by this life transition. There are a number of strategies to build your confidence when faced with a potential job loss including open communication with your family, understanding your current financial situation and proactively enhancing your career asset. While there are times when layoffs occur without notice, there are often warning signs in advance. As soon as you sense a potential change, it’s critical to discuss your concerns with family members. Whether the change actually occurs, sharing goals and expectations is a worthwhile exercise by itself. Expressing your fears and worries with your partner starts the process of identifying potential solutions to address the career uncertainty you’re facing. Developing solutions is dependent on your current financial situation. Review your assets and outstanding debts by creating a list of each category. Focus on “liquid” assets that are easily accessible (preferably without taxes or penalties) for an indication of how well you’re prepared financially to handle a job loss or other impacts to your career. In addition to an inventory of assets and debts, look at your current sources of income. Recent pay stubs and last year’s income tax return provide a reasonable idea of your income. Compare this with an estimate of your expenses and you can start to determine how much of an impact losing your job will have financially. While it may be a tedious exercise, looking through bank and credit card statements provides insight into where your money goes as well as the amount of control you have to adjust the expenses. The results from these exercises may not be pretty but ignoring your financial realities only exacerbates the stress if you find yourself without a job or dealing with other career uncertainty. Sharing the results from reviewing your financial situation with your partner provides a helpful reality check as you identify your next steps. One of these steps should involve enhancing your career asset (which is applicable even if you don’t face a job loss). Several ways to do this include proactively networking within your company and industry as well as assessing your skills. I’m continually surprised to see people who lack a profile on LinkedIn, which is one of the most helpful websites for connecting professionally with others. If you’ve been neglecting your professional skills, now may be the time to register for a course or attend a professional association meeting (which helps with networking too). Even if you’re not currently facing career uncertainty, being prepared will increase your confidence to overcome the fear and uncertainty associated with this life transition. 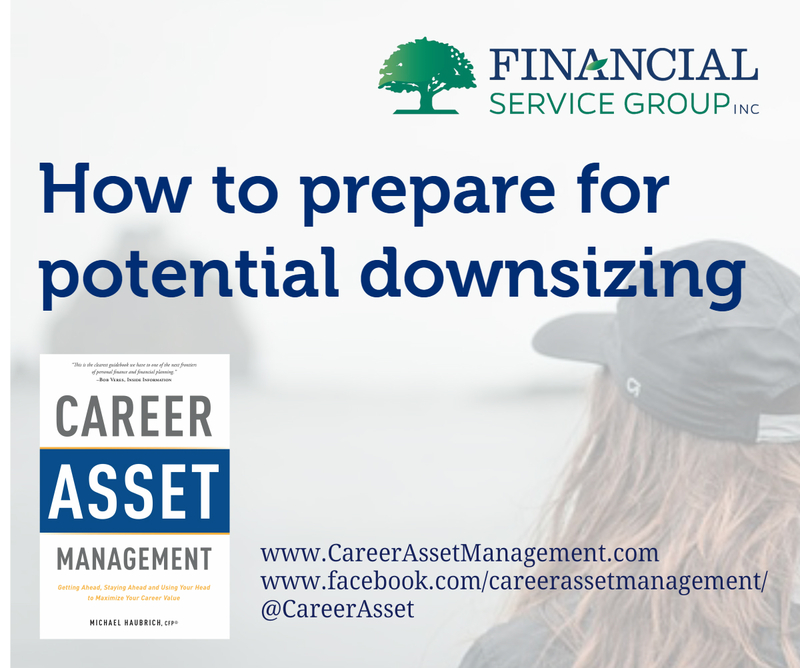 To learn more ideas about optimizing your career asset, please visit www.careerassetmanagement.com or order a copy of Financial Service Group president and founder Michael Haubrich’s book on this topic.